The U.S. Senate has approved two Republicans nominated by President Donald Trump to serve on FERC, which oversees the nation’s power grid and natural gas pipelines. The unanimous vote yesterday restores a voting quorum that will now allow American energy companies the ability to move forward with projects that will create jobs and improve our security. Among them is the $1 billion PennEast pipeline in Pennsylvania and New Jersey. On May 29, 2015, NJ Spotlight presented a public roundtable on the pros and cons of pipeline construction in the Garden State. Business Manager Greg Lalevee presented the Local 825 viewpoints. If you’d prefer to read NJ Spotlight’s written coverage, click here. 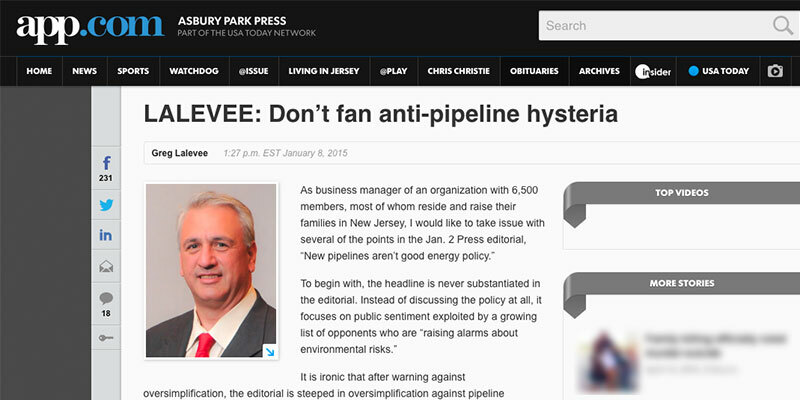 Local 825 Business Manager Greg Lalevee responds to anti-pipeline editorial with a call for objectivity. SPRINGFIELD, NJ, Sept. 2, 2014 – Operating Engineers Local 825 and the Engineers Labor-Employer Cooperative (ELEC) today jointly announced full support for a proposed 100-mile long pipeline from Luzerne County, Pa., into New Jersey. FERC approves Spectra Energy Pipeline — construction begins! The Federal Energy Regulatory Commission (FERC) gave final approval of the natural gas pipeline expansion to run through parts of Jersey City and Bayonne and offshore of Hoboken. The approval is the latest in a years-long effort to find an acceptable route for the pipeline and allow work to begin. That report said the 20-mile pipeline would have “limited adverse environmental impacts” mostly during the construction phase. The plan received final approval by the commission’s board on May 21. IUOE Local 825 members had supported the pipeline project for more than two years to help meet increased demands for natural gas in our region and provide good jobs for our members. Pending approval of a final implementation plan, a controversial interstate energy expansion project got the green light from state and federal regulatory officials to construct nearly 7 miles of natural gas pipeline through Hunterdon County. The $341 million Northeast Supply Link project is designed to expand the Transcontinental Gas Pipeline Co.’s existing underground pipeline infrastructure to transport natural gas produced by Pennsylvania’s Marcellus Shale fields to northeastern markets. The project is expected to deliver gas to Princeton and New York by November 2013, with construction scheduled to begin this spring, according to a spokeswoman for the project’s owner, Tulsa-based natural gas transporter Williams Partners LP.